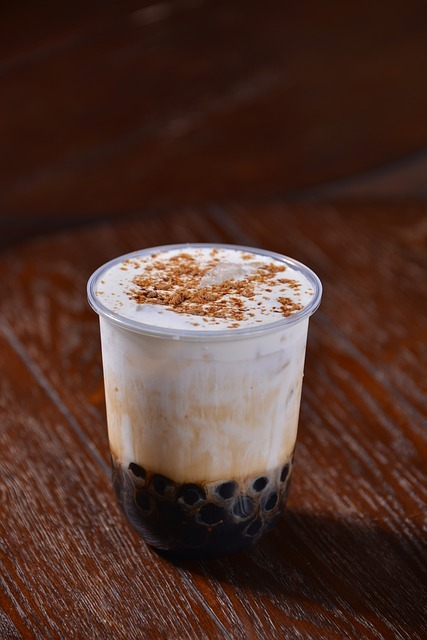 A number of people I know is very addicted to the bubble milk tea- to be specific, the one from the Chatime. Now that Chatime delivers to the office, almost everyday there would be people from my office ordering and they would have no difficulty meeting the minimum order amount of 16 in order to deliver. There are a number of companies here selling bubble milk tea and they are addictive that everyday we crave for it. Yours truly is one of the regulars who would almost never fail to order with them. But when we drink the bubble tea, we are literally drinking in empty calories- it is something we often are not aware of- it is easier to remember that you’ve eaten a cup of ice cream or a bar of chocolate but after enjoying the chewy pearls that you chew along with each sip of tea, it’s hard to imagine that there are at least few hundred calories in a cup of bubble tea. Do note that for cold drinks, generally higher amount of sugar needs to be put inside so that it is delicious. According to Live Strong website, a 500ml of bubble milk tea contains about 292 calories. A forum said it could be 350 calories- which is not surprising because regardless of whether I order with normal sugar, or half sugar, it is still very sweet. My friend who ordered other varieties and asked for no sugar- even the drink is sweet. My friend told me that she stopped adding pearls to the bubble tea but replace with grassjelly or other alternatives because she said it is really fattening- and anyone who is watching his/her weight- it is a slimmer’s nightmare. I’ve noted that most of the regulars bubble milk tea drinkers are beginning to put on weight. Another friend who is very conscious about her weight stopped drinking all together after noticing that she had put in weight in a short span of a 2 weeks about ordering twice a week. Anyway, it could be the stressful situation we are currently facing at work- a cup of Chatime hot milk tea with pearls seems to offer some warm comfort (even though by the time the drink arrives it is only lukewarm). However, if you are addicted to the bubble milk tea, please ensure you exercise regularly – keep yourself really active. Else, there is a strong risk of developing diabetes because the sugar content in milk tea is very high. There have been thsoe who tried to defend milk tea, saying that it is not that bad since the milk tea came from Taiwan and Taiwan has the lowest obesity rate in the world. Generally, Taiwanese and Japanese folks are quite disciplined in terms of eating. If you walk to work and take public transport, eat just plain noodle soup for lunch (no fries, fast food, deep fried stuff), what is that cup of bubble tea once a while. Furthermore, if you are from Taiwan, bubble tea shops would be around every nook and corner that you go. You’ll probably see the stuff so much that you are not addicted to it. Whereas in other countries, it is a novelty. You’ll probably need to drive or take some public transport to get to the nearest Chatime outlet. And Chatime milk tea, together with the typical American fastfood diet or the local food fare – whereby we are already exceeding or nearly our daily caloric intake- add that cup of bubble tea and whoa- the spare tyres start to form. Imagine, everyday even an extra of 300 calories- you can easily put in pounds without noticing. RELATED: So you have sinned in a big meal, what to do next? Even in Thailand, their drinks are seriously very sweet. Even their Coke and Pepsi is sweeter than the versions in Malaysia and Singapore. And everywhere you go, they have lots of desserts high in sugar and their food is high in fat. Yet, most of the Thais are slim. Why is that so? Because they eat in smaller portion and they walk a lot. They always use the overhead bridge, a small bowl of noodle soup is enough for them for lunch. For dinner, they just take a small pack of rice with dishes that are not fattening and in small portion. So even though their little tid bits are sweet, even the young generation have no problem remaining slim. It is the choice of food that we take that maketh us to be the size we are. So, we need to accept it like a good sport- and then try to do something about it. Because of Chatime, which I know that I am quite hopelessly addicted, I discipline myself to try to exercise at least 3 times a week. Yes, the weight may still come in but I always believe that physical activities can help to balance up our hormones. If I can’t do something about the addiction, at least I can do something to try my best to prevent from getting diabetes. Maybe one day I would be able to get it in my thick skull that giving in to the tea is not worth the exercise I need to put in later.